Home Blog Apple Mac Accidental Damage Cover – Included Free on Selected Macs & iPads – and now on Surface Pro, Go, Book 2 & Laptops! 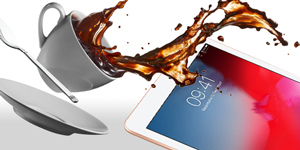 Accidental Damage Cover – Included Free on Selected Macs & iPads – and now on Surface Pro, Go, Book 2 & Laptops! All of HardSoft’s leases include a ‘no quibble’ three-year warranty that is standard on all products and we have now extended this to include a FREE accidental damage cover across our Mac and iPad ranges – it’s always been included with our Surface Pro range and has now been extended to include the Surface Go, Surface Book 2 and Surface Laptop! – with both our Flexi-Lease and Flexi-Lease+. 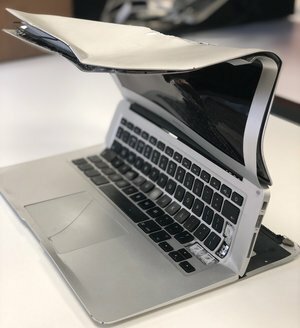 MacBook Air Damaged by an Escalator! Our accidental damage cover extends our standard three-year warranty, and covers devices which have been damaged by spillages, being dropped, or even, as with a recent claim, a disagreement with an escalator! We often talk about the HardSoft Difference, and this free accidental damage cover is just one of the things that makes up that difference. Everyone knows that leasing gives businesses the option to spread the cost of their IT equipment, but with the HardSoft Difference, our customers benefit from our service and support wrapper; including brand new equipment delivered the next day, on and off site technical support from our highly trained team of engineers and technicians, and access to an equivalent loan machine should yours need repairing or replacing. Combine that with our previously mentioned 3-year ‘no quibble’ warranty, and a great range of leasing solutions to suit your needs, leasing with HardSoft really is different. MacBook Pro 15″ with Touch Bar: 2.2GHz, 256GB Flash Apple iMac 27″ Retina 5K: i5 – 3.7GHz iPad Pro 12.9"
As with all insurance cover, there are a few exclusions to be aware of, but our team will be happy to go through full terms and conditions with you. Accidental Damage Cover is now ALSO FREE on ALL Microsoft Surface Pros, Surface Gos, Surface Book 2 and Surface Laptops! Get in touch with our sales team for more information about our leasing solutions, 3-year warranty, and accidental cover. Call 020 7111 1643, email sales@hardsoft.co.uk, or use our webchat option on the website.